This week started off with a commemorative occasion of note, at least if you live in the Czech Republic or Slovakia. Monday, 21 August, marked the 49th anniversary of the 1968 Warsaw Pact invasion of Czechoslovakia to crush the broad-based Communist reform movement underway there known collectively as the Prague Spring. OK, the 50th anniversary next year will presumably be a much bigger deal. But for remembering officially the event in those peoples’ political history which, in its long-standing trauma, probably corresponds to the 9/11 attacks in the US, at the least, every year’s 21 August is surely worth some official attention. 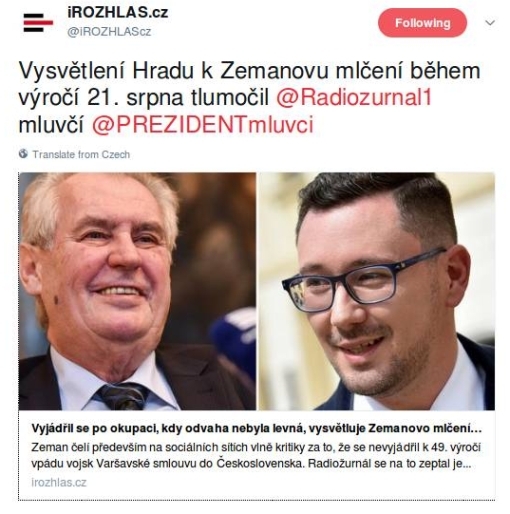 But not from the Czech Republic’s President, Miloš Zeman, at least not this year: there was nothing from the Presidential Palace, no attendance at any ceremony, no statement. Naturally, then, the State Radio’s news channel, Radiožurnál, wanted to find out how come. Gaining no access to Zeman himself (perhaps somewhat understandably), they turned to his official spokesman, Jiří Ovčáček. In other words, the President bravely expressed himself during that period when it was no cheap thing to do so, [whereas] today the sort of people who opine on this sad anniversary are those who during Normalization [the period following the ’68 invasion] were satisfied with digging in to the gravy-train [CZ: chrochtali u koryta]. Now, Zeman is getting old, perhaps he momentarily forgot that he is, after all, President of the country. And then: “Isn’t he going to return to the subject at future anniversaries?” “The President puts forth his views on this almost every day, when he speaks of how the Czech Republic must remain a sovereign nation” and bla bla bla . . .